He’s been flying in a variety of industries, including real estate, construction, military, and agriculture. Most of his work self described as “pretty pictures and video.” He’s also done a lot of work with production houses, and enjoys the pressure working in that environment. For a lot of his work, there is only one chance to get the shot, so he makes sure everything is ready before the shoot. Listen in to the podcast to hear how he describes a shoot where a large ship was leaving the dock. Yeah, that’s one of those operations where you can’t press pause and have the boat start all over again! Being from Australia, Steve isn’t familiar with what it’s like flying in some of the freezing temperatures that we get here in Canada. If you’re looking for winter and cold temperature flying tips, have I got the answers for you! Check out the link in the previous sentence, as well as my tips during our discussion. Beyond the weather and stressful shoots, we also discuss marketing ideas, video editing, and advantages of dual vs single operator flight. We also talk about the massive advantages of practicing ATTI mode flight. Be sure to listen in and subscribe to The Drone Trainer podcast, wherever you get your audio! 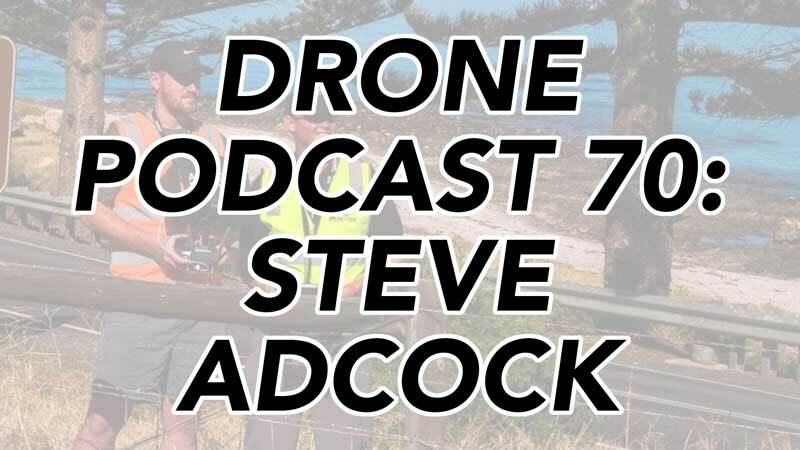 I hope you enjoyed this week’s drone podcast with Steve Adcock! Once you’ve had a listen, feel free to leave a comment below so that Steve and I can hear what you think! Check out Steve’s work and follow him on social media! Great pod cast Steve! Wonderful work Chris on all you have provided us drone geeks, absolutely love the podcast keep it up. Looking forward to the next one. Thanks Lyle! I’m glad you enjoyed hearing your requested guest on the show!